After the celebrations we moved to Austria to stay on as an army of occupation. We spent a few months in Styria in a Schloss (castle) in Sheliton. The 46 Division disbanded and we all transferred to different units. I said goodbye to Joe Kendrew and never saw him again. In Austria, we moved to a place called Klagenfurt and began the serious task of occupying an enemy country. Fraternising with the Austrians was not tolerated and we went everywhere with side arms. We then moved on to Graz and received a welcome fit for conquering heroes. We had taken over from Soviet Mongolian troops, who by all accounts had been brutal which was why we’d been made so welcome. We settled in another Schloss and our captain soon got his feet under the table with the Von Schwarts family who owned the castle, and was seen many mornings at dawn by the guard coming away from Dolly Von Schwarts (the daughter of the family’s) apartment. Although there was a fraternisation ban most of us made friends with Austrian families. A friend of mine, Len Parmenter met a very nice girl but on their second date he couldn’t go so he asked me if I would go, make his excuses and take her out instead. When I met her I could tell that she thought that she was being passed around. Her name was Matilda and most people called her Hilda. On that date I called her Tilly and she has been called Tilly by everyone to this day. I took her to the cinema and then for a drink, and I was the perfect gentleman. As proof of this, Len and her eventually got married before they left Austria, and I stood for Len as his best man. One day I had gone out for a walk in the woods against all the rules to go alone. I eventually came across a small village called Rolling, and met the local priest who could speak Italian. As I had been in Italy for two years and lived for some time with an Italian family, for a short time I could speak fairly good Italian. The priest invited me to his house, and we had a coffee and talked a lot. He invited me to come round the following week to meet some friends which I did. Unfortunately I stayed later than I should have done and when I went out it was dark. I started walking back through the forest to return to the castle, but after an hour I realised that I was completely lost, so I decided to bed down under a tree until first light. I’d been there some time when I was woken by the noise of voices. At first I couldn’t distinguish them, so I hid in case they were German soldiers who hadn’t surrendered. Then I heard English voices, it was a patrol of my friends who had set out to find me, so we went back to the castle safe and sound and no-one else found out about it. I visited the priest and he introduced me to two sisters, Hilda and Louise Von Heifer who could speak excellent English. I made many visits to their home and was introduced to their mother. Hilda was the eldest and Louise was about my age (22). Louise and I had a close relationship, but only as friends, I kept my distance knowing the situation at home if it had become serious. Louise’s mother was absolutely charming and treated me like a son. When I left them for the last time there was a chance that I might be going to Burma, and she drew a little cross on my forehead and said “God keep you safe”. She was a catholic, and I had often watched her cross herself when we were talking about the war. When the Division was split up, I was not posted to the Far East as expected. Maybe it was the blessing. Instead I was posted to a small Austrian town called Judenburg to join the signal section of the Royal Gloucestershire Hussars. These were ” the good times”. Horse riding, skiing, sport skating, girls – they were more like English girls and went out with soldiers without a chaperone! I was in charge of the local telephone exchange, a dozen Austrian girls and one soldier on the military switchboard, and a good time was had by all. We had the job of escorting the White Russian Cossacks, who fought on the German side, back to Russia. There were quite a lot of Cossack horses left behind and we took about a dozen. Signalman Tucker, who knew about horses, was put in charge and gave me my own horse which I had for the rest of my time in Austria. I called him “Kiade”. We had skiing instruction but the five others in my group gave up so I had my own personal tutor, an Austrian ski instructor. So I spent most of my time skiing and horse riding. There was a skiing competition in Cortina d’Ampezzo in the Italian Dolamites between us, the Americans and the Poles. I didn’t win anything but it was a great experience. We did downhill, slalom and cross country skiing. After five years of fighting and training I was pretty fit and we did thirty mile route marches, slept in the open and then thirty back with ease. 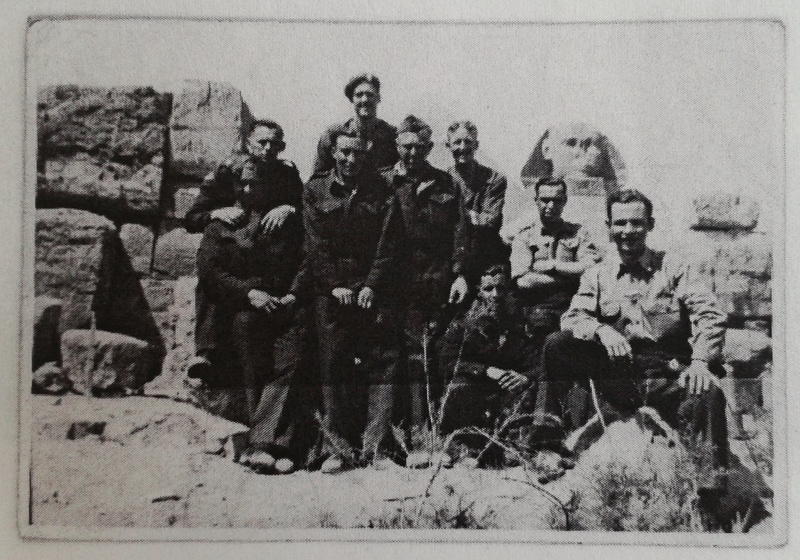 Most of the work duties were done by the German prisoners so we had plenty of spare time. The Hussars would do musical rides and it was great to go with them to different towns in Austria giving exhibitions. After twelve months I was due to leave for England, the first leave for five years. We went by road to Calais, across the channel then on a train to Manchester. I arrived at London Road station (now Piccadilly) about 1700hrs, 5pm to the civilians, and it seemed so long since I had left. I was feeling really nervous about going home, and really felt that I had been a boy when I left and was now a man. I solved the problem by staying the night in Manchester at the St. George’s club. When I had been wounded in hospital there was a Canadian in the next bed to me who looked after me, and as I stood queuing in the restaurant I looked up and there he was, right next to me.! The next morning I headed for home. I can’t remember much about arriving home but do recall being told to go and meet my sister Doreen at the C&A department store in Manchester. She was a little girl of ten or eleven when I left. I walked past a young lady at the top of the stairs, it was Doreen and I hadn’t recognised her. She was now sixteen and had changed so much. It was quite traumatic for her. Her soldier brother had returned after five years and walked straight past her, not a good start. I can’t remember how long my leave was for but I was very unsettled and was glad to get back to my normal life in the army back in Austria. Life went on until it was time for my de-mob. I handed Kiade (my horse) over to Signalman Tucker and was assured he would be well looked after, gave my ski equipment away, said goodbye to the girls on the switchboard “Aufwiedersehen Fräulines” and left. I arrived at Aldershot to collect my ‘civvies’ and a train pass to Manchester and went home.